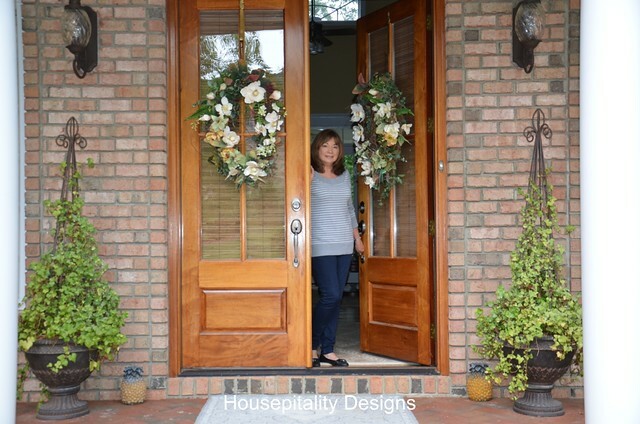 Hi there….I am Shirley with HOUSEPITALITY DESIGNS. …..I was over the moon excited…”Yes, absolutely”…as I was doing cartwheels across the floor! 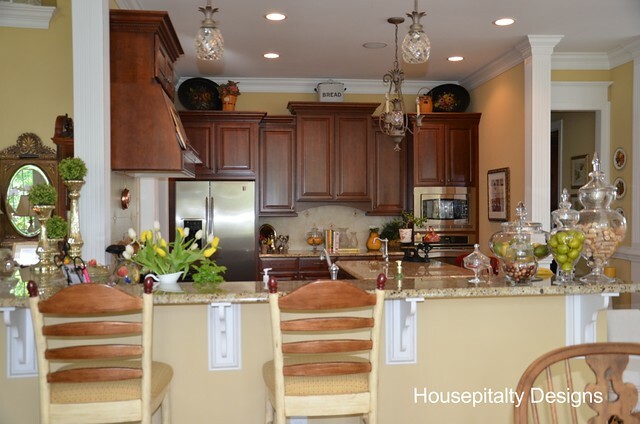 So, today, I am very honored to present my home to you on Debbie’s Friday Feature of Homes. I live in North Carolina…. We relocated to North Carolina from Florida, where I had lived most of my life. We love it here. It was a difficult move as we were leaving our friends and family, so that we could be close to our son and his family. We had our home built in a beautiful golf course neighborhood. We chose this plan as almost every room had a view. A view…”it’s all about the view”…..So come on in and hope you enjoy the tour! 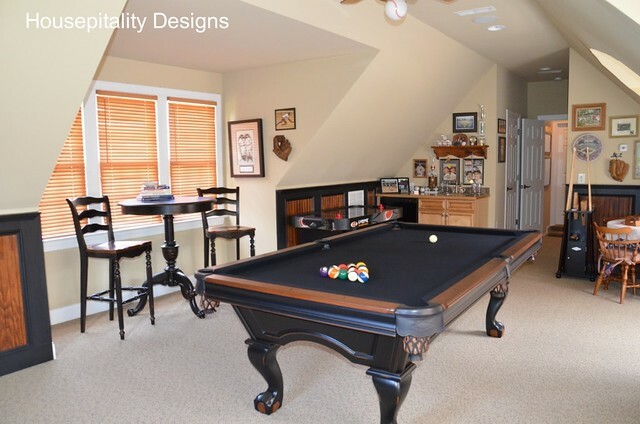 With the exception of a few bathrooms, and the bonus room, all the rooms have a view of the back yard. Starting off with the living room area…..
As you will quickly see, the main floor is really one large room…We wanted that casual, great room feel. 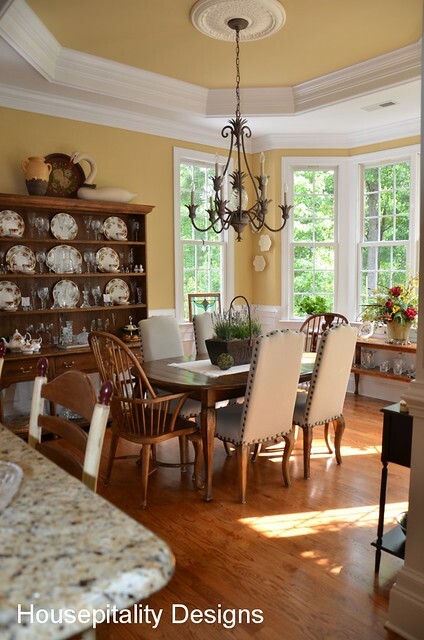 So now, we move into the dining room…It is a casual room…unlike many dining rooms, it faces the back of the house. 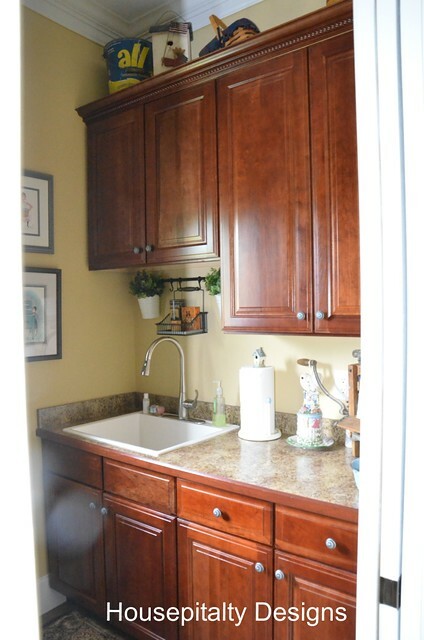 And now we move on to the kitchen…. 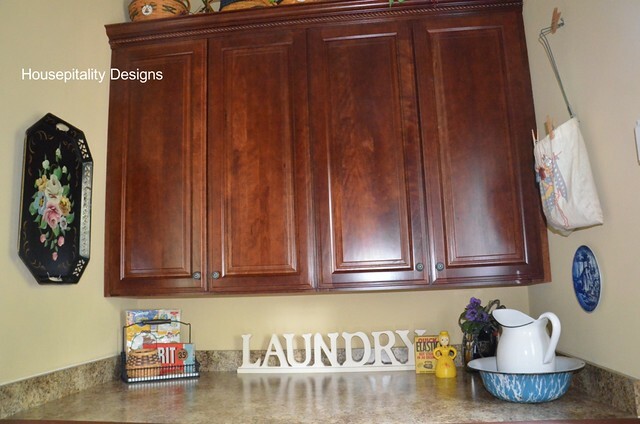 We had many cherry and mahogany pieces, so it was best to go with the cherry…(or so I thought at the time)…. But at least I sneaked in the farmhouse sink!!! 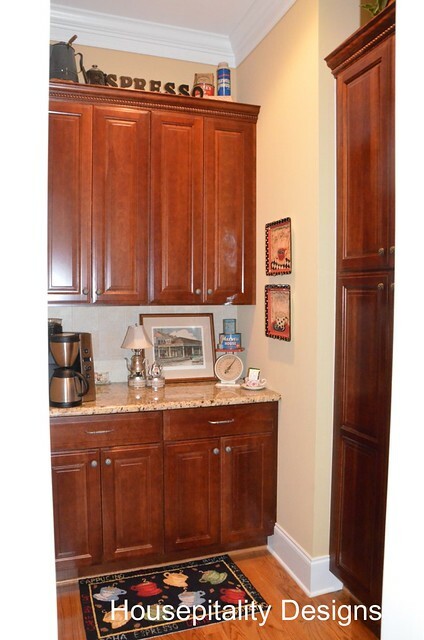 builder re-work it into a butler’s pantry with plenty of storage behind cabinetry…. Then the house went up next door…so I decided to place curtains half way up..so I do not subject my nice neighbors..
Now, have you had your second cup of coffee yet…you may want to grab another as this post is heavy on the photos!! I’m really needing that wide angle lens…hope “honey” is reading this! 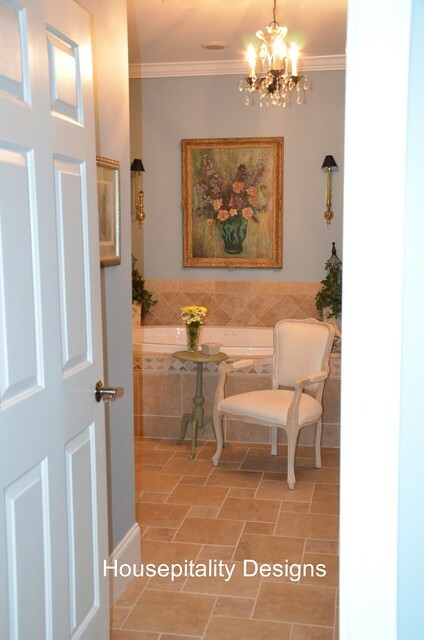 The walls will soon be painted with SW Silvermist..the same as the master bathroom…haven’t made it in there yet! So now..I am going to take you to the other floor….and hope that I have not lost your attention…. As I said, this is definitely a two cups of coffee (or tea) post…. 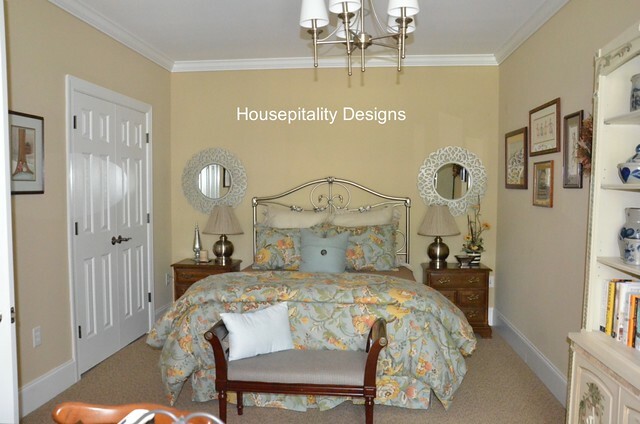 ….for our guests to enjoy! Comes in handy after a long day of softball games! 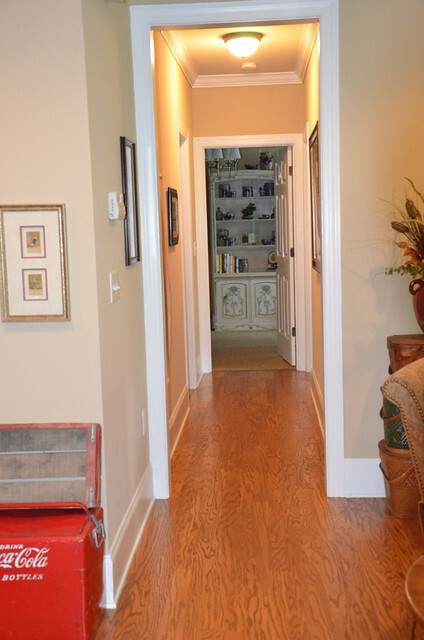 So down the hall to the media room we go…. The saying over the doors are there all year round…a request from our Granddaughter! 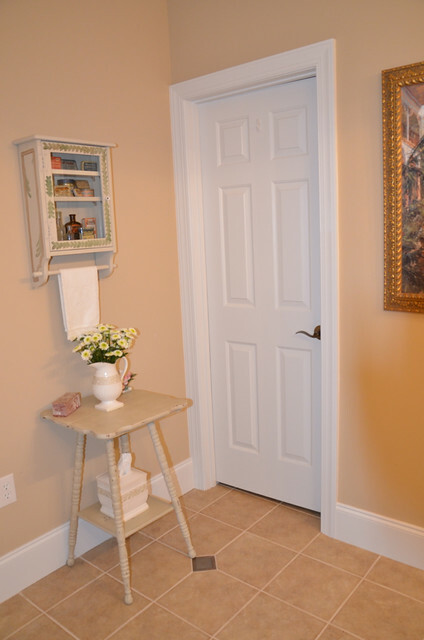 So let’s move down the hall…towards the second guest/little (and I mean little) craft space…. 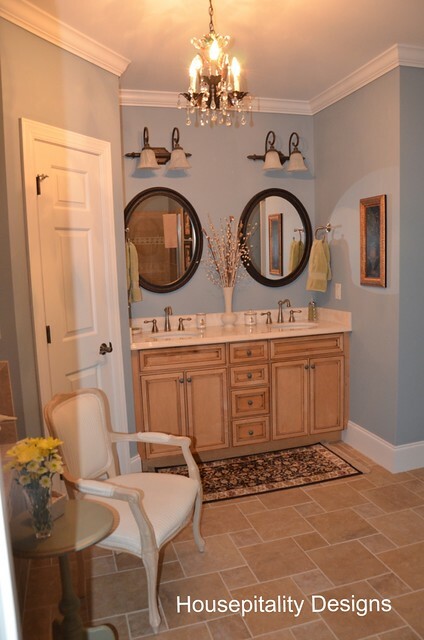 Another bathroom for guests…no windows here..so light not great…. 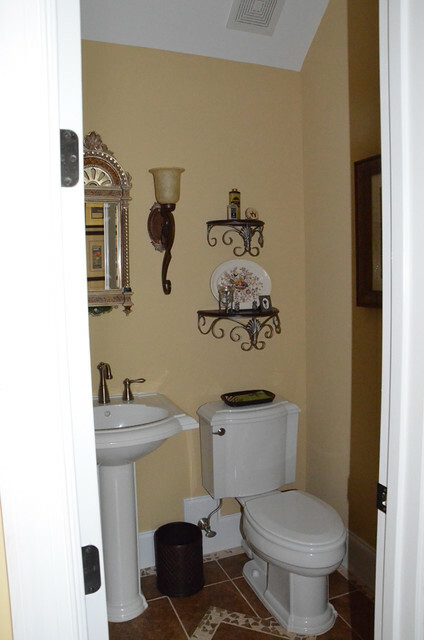 A very large shower and toilet area beyond the door…. 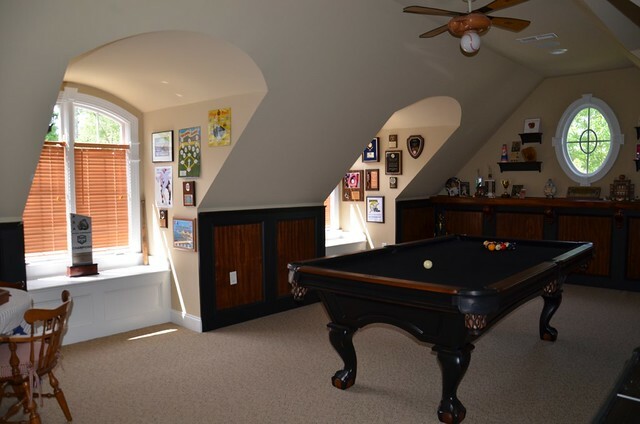 And here is a “glimse” of my hubby’s office…we utilized the 4th bedroom for it….he was in there working…shhhh…. He also has a great view when working…. 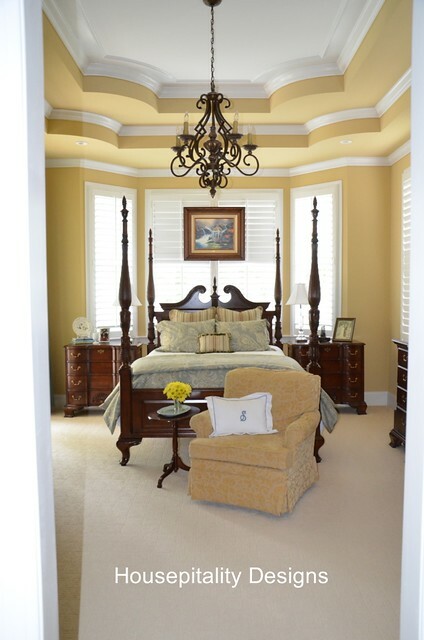 Now, last but not least there is one more room to show you for today….whew…you probably thought this would never end! 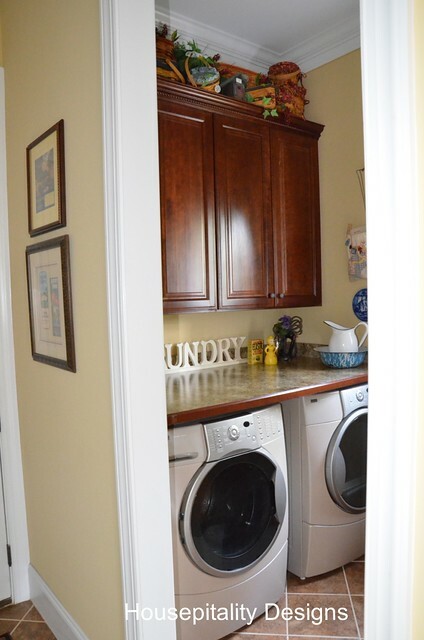 There is a bathroom and a large closet in that room also…but not really photo worthy right now!…. So, I hope you enjoyed the very L O N G tour of my home…. 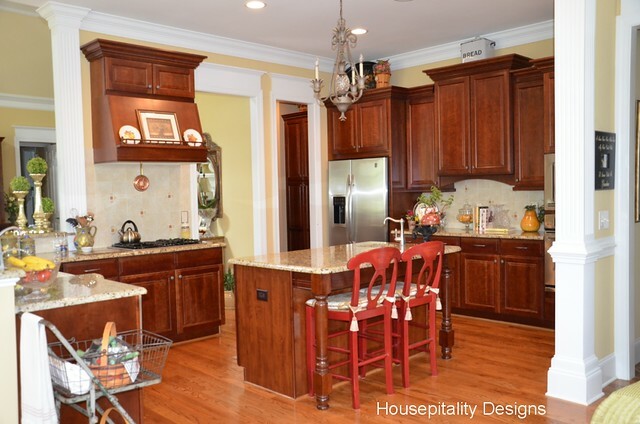 Thank you so much Debbie for giving me the opportunity to present my home…you are the best!! Y’all, have a wonderful weekend!!!…. Thank you Shirley for having us over to your lovely home! It sure is a stunner. If you do not know Shirley, I would go on over and say hello. She is a real sweetie of a lady and always has something fun to share! Holy cow, what a house!! This is just stunning~so many rooms in such gorgeous detail! 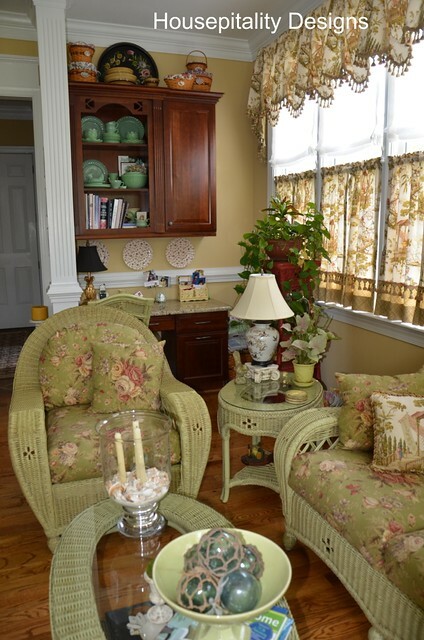 I would love it if you would do a post JUST on the sunroom, with closeups of the window treatments, the fabric on the wicker and all…it is my favorite room! 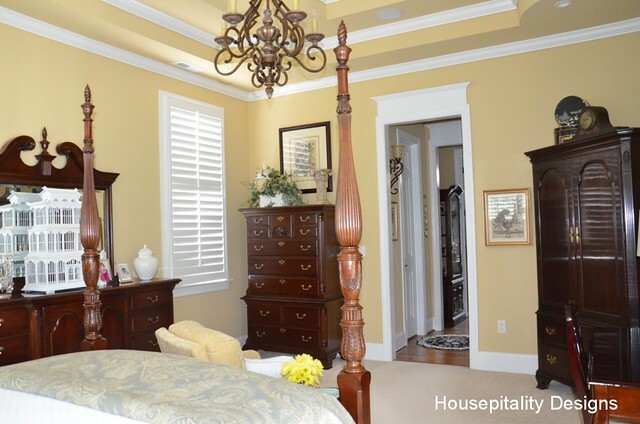 I love the color of the wicker too, it resembles Versailles chalk paint color…just lovely! Debbie…I want to thank you again for the honor of you featuring my home….I must stay that I am a very happy “Graduate” of your “Newbie” family….You provide such a great venue for all the “newbie bloggers” to get their start….Have a wonderful weekend! What a lovely warm home! Thank you for sharing it with us. 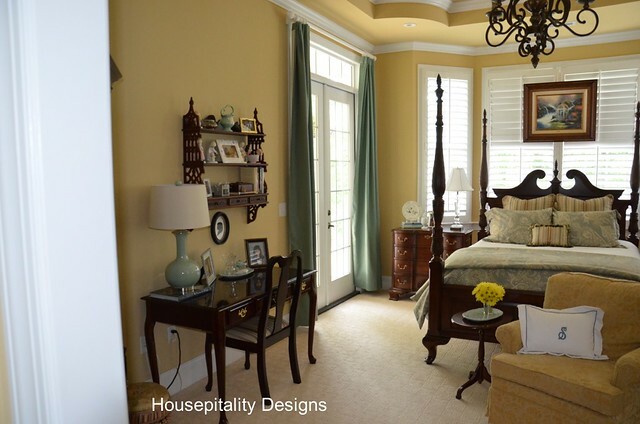 AMAZING home….love every room and the outside wow! Thanks for sharing such a beautiful place. Love her style and decor! Debbie I love Shirley’s gorgeous home and have been a happy follower of hers! It was so nice to see the full tour! Have a great weekend! OMG!! What a beautiful large home for 2. I hope you have a large family. This home is stunning. 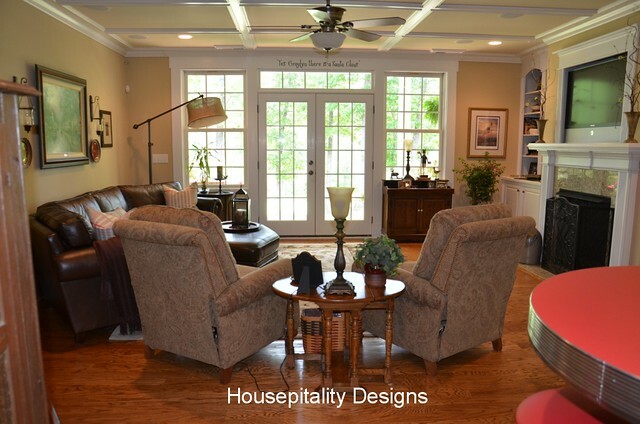 I’m going over to Shirley’s blog now…..
Debbie, Her home is just stunning there is not one thing I don’t like. Simply gorgeaous. I enjoyed this home tour so much! I follow Shirley’s blog and have always enjoyed her posts, but have never saw a full house tour like this. I had no idea her home was so large! 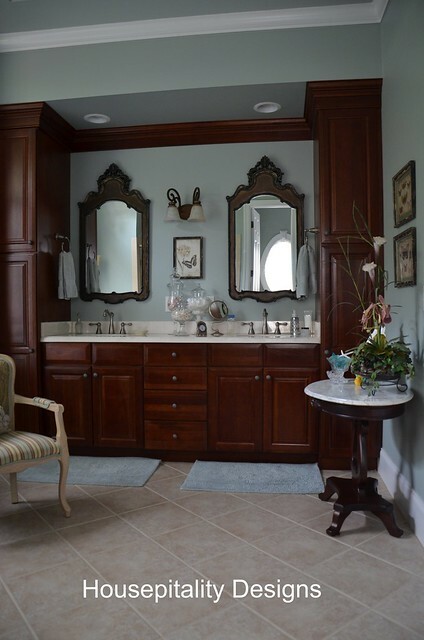 I love all of her huge bathrooms! 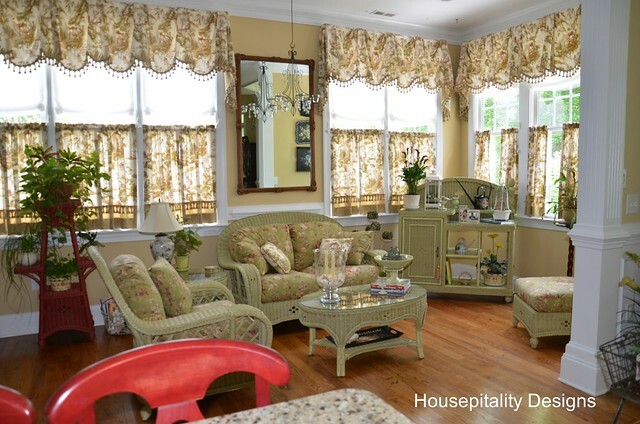 Her home is southern traditional in every sense of the word. 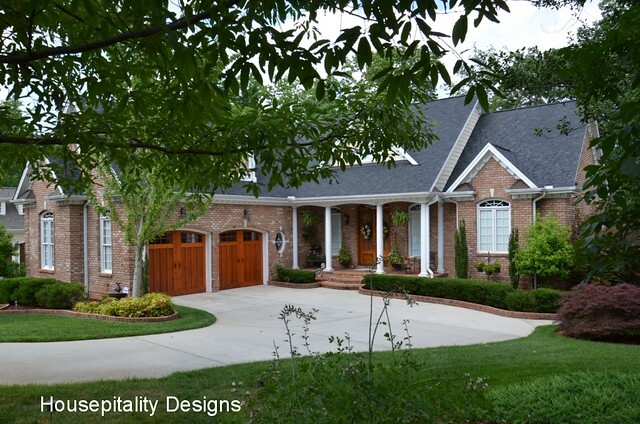 Perfect for a home on a golf course in NC!! 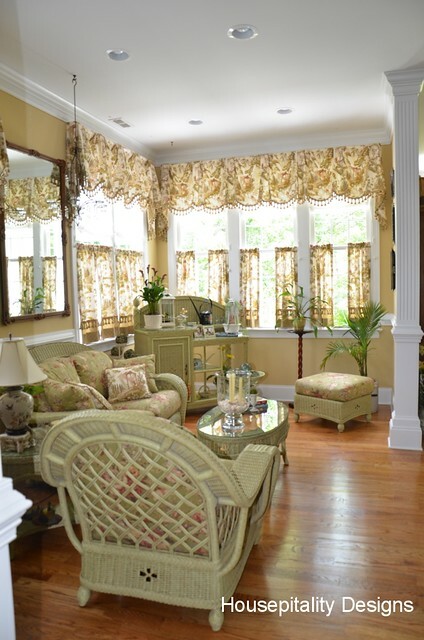 Love her window treatments in the sunroom and how her color scheme is consistent throughout. I love all of her windows and doors on the back of the house. That is a well thought out home design. Thanks for sharing this today! I’m fortunate to live just a short distance from from Shirley! I had the pleasure of meeting her back in February when we took an ASCP class together. I dropped by her house last night (to deliver something she won from me) and was given a personal tour of this extremely drool worthy home! Shirley probably got tired of me oohing and aahing as we entered each and every room. A truly beautiful and welcoming home, but the most beautiful things of all are the warm hearts of Shirley and her hubbie! Shirley, we have very similar tastes. We used to live on a golf course and our walls were a similar color. The floor plan was very open, but our house was not nearly as large as yours. I spotted your Lance cookie jars on a counter. I have had some for a very long time, but I don’t have them displayed right now. And I noticed your monogram, too! It looks fabulous! You are such a warm and lovely person … and your home is a perfect reflection of your personality! It’s so amazing. 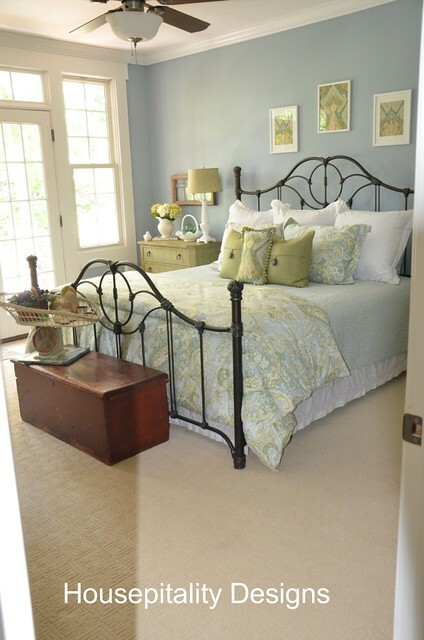 And I think I fell in love with that guest room. I think you’d have to pry me out with a crow bar. What a beautiful, warm, inviting home. 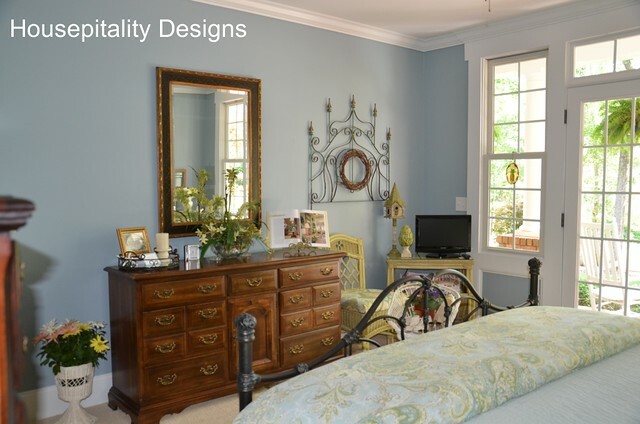 Every room is so lovely, and perfectly appointed. What a gorgeous tour!!! WOW!!! 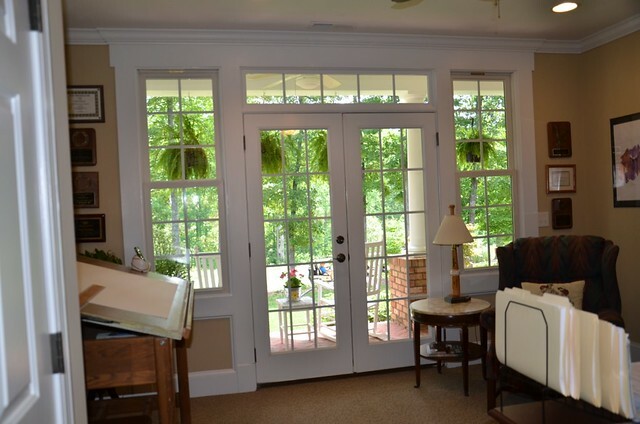 Everything looks so beautiful, warm and inviting, a true Southern hospitable home. I have followed Shirley’s blog and it is always so evident that she puts much thought, care and love in every aspect of her home. Also in these economic times I have appreciated the thrifty projects and inexpensive decorating tips she shares. Only wish I had an infinitesimal amount of her decorating gift. simply aaaMAAAzing! 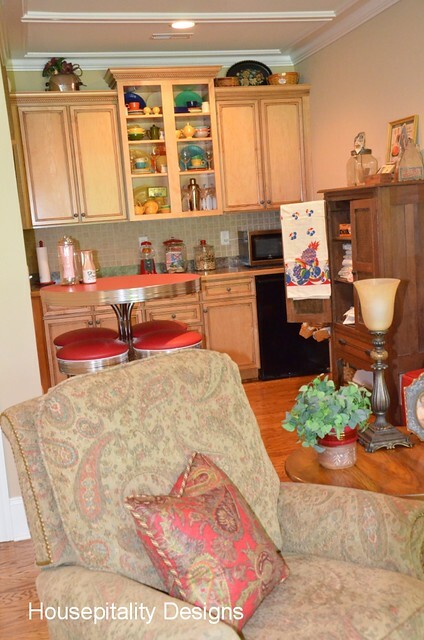 Thanks for sharing her with us Debbie…..
Shirley’s home is GORGEOUS!! I just absolutely love it all. 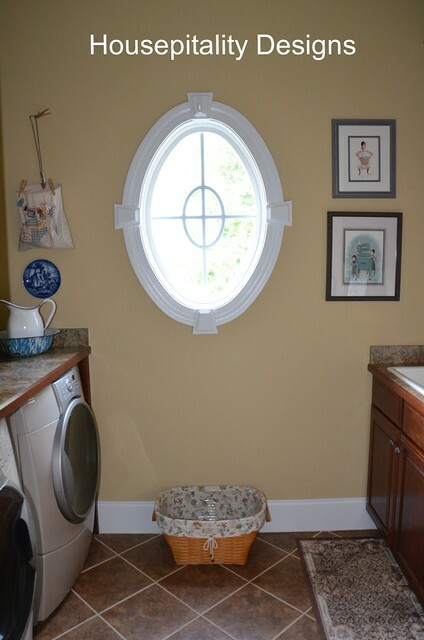 So many incredible details with the moldings and that oval window in the laundry room is stunning! 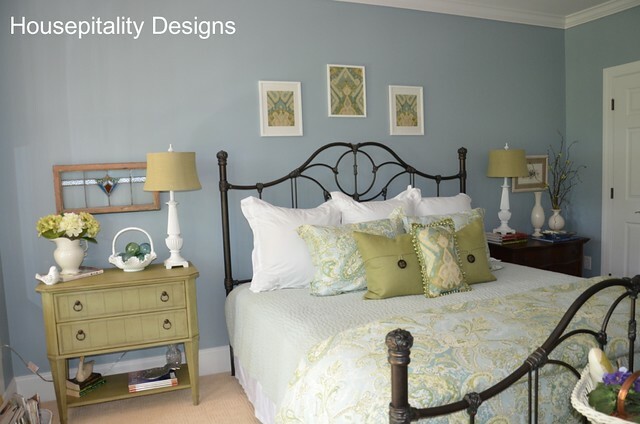 The color palette is right up my alley and she has truly created a warm and welcoming home. Definitely Southern Traditional! So glad you shared this with us Debbie and now I need to go back and look through all of the photos again. LOL! 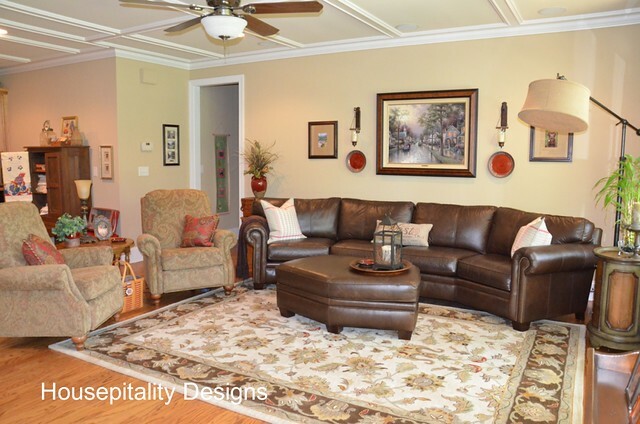 Debbie, I so enjoyed this home tour! What a fabulous home!!! Now I best scoot on over to say hello to Shirley!! How have you and your family been? Ready for summer?? You will make her day Kris!~ Thanks for stopping over all of you lovely ladies. Shirley truly is the warmest and her home sure does reflect this! 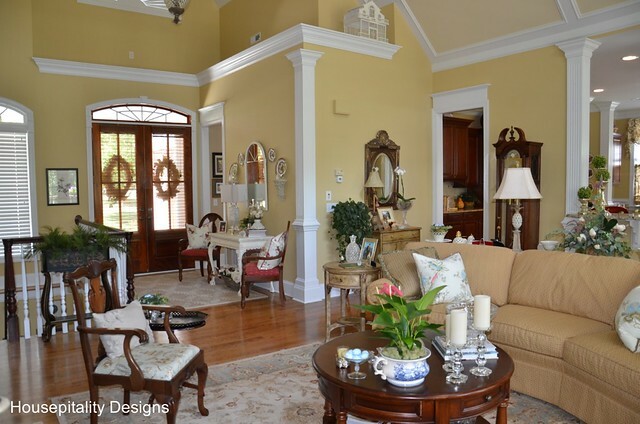 What a beautiful Southern Traditional home! I love the front porch and the back elevation of the home. Great views. The molding on the ceiling in the master is gorgeous! 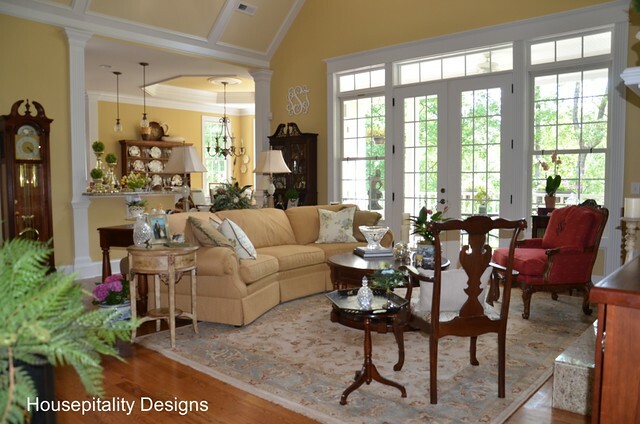 Beautiful and spacious home ~ love, love all the windows and french doors. Thanks so much for sharing! 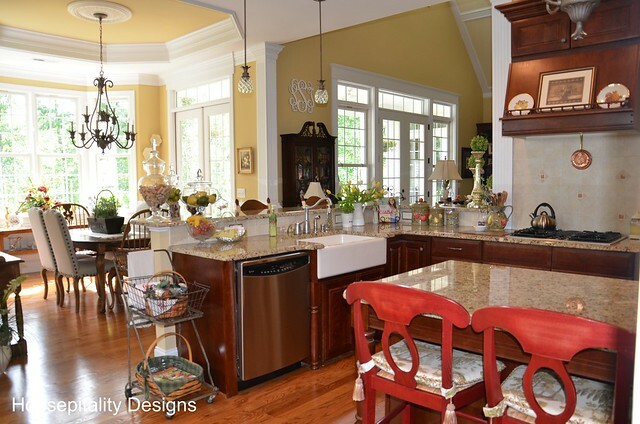 Debbie thank you so much for featuring Shirley and her gorgeous home. It is so warm and inviting!! Stunning home. I am off to stop by her blog. I just love Shirley and her home!! I’ve been following her for awhile now and just found out she lives down the street from my husbands aunt and uncle….it’s a small world after all!! Shirley! You know how much I absolutely love your house. My favorite thing is that you took and obviously large home and made it feel so cozy and happy and friendly. 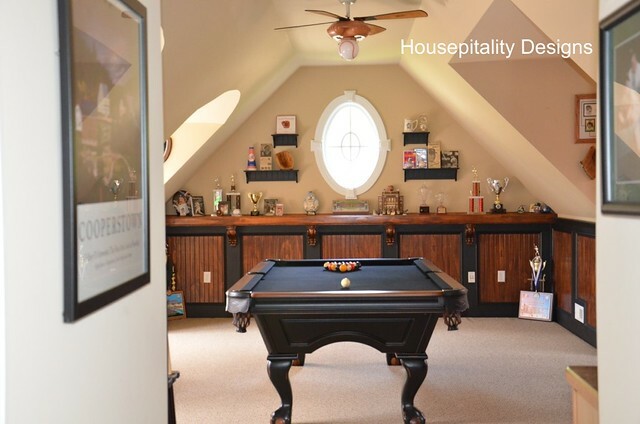 Debbie, what a perfect home to feature on your home tour. Great great post! Holy wow that is a beautiful place. Thanks for bringing it to us! Just stunning! 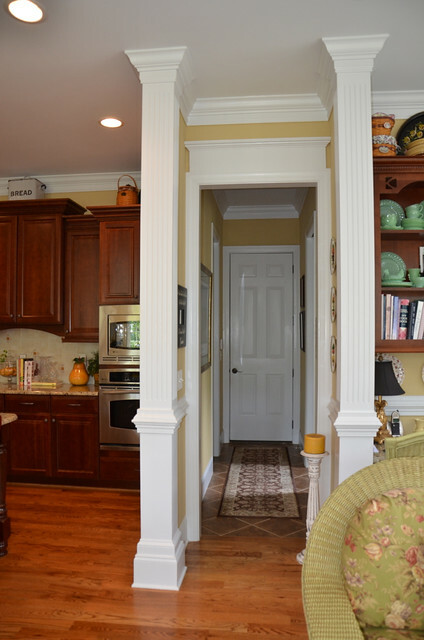 I love home tours, especially Southern homes! Thanks for sharing! truly make it your special spot, your family home. This is such a stunning home! I love her decorating style too. Thanks so much for sharing it with us. wowzers.. Thats a beautiful home. 5 times too big for me but BEAUTIFUL to look at for sure. It is beautiful Shirley. 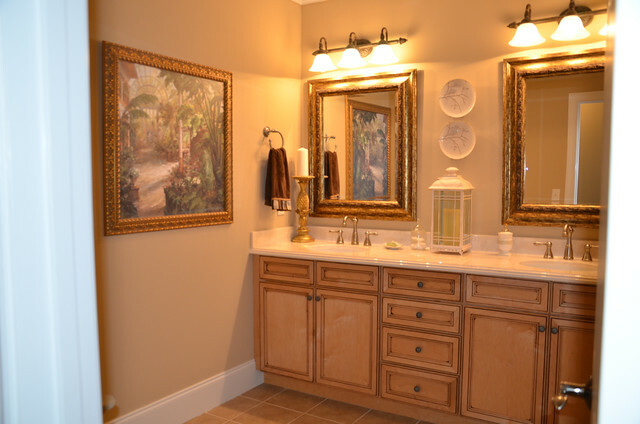 It is so easy to see how much love and detail you’ve put into every room. Really enjoyed this home tour! So much fun! There’s that word again. AWESOME!! 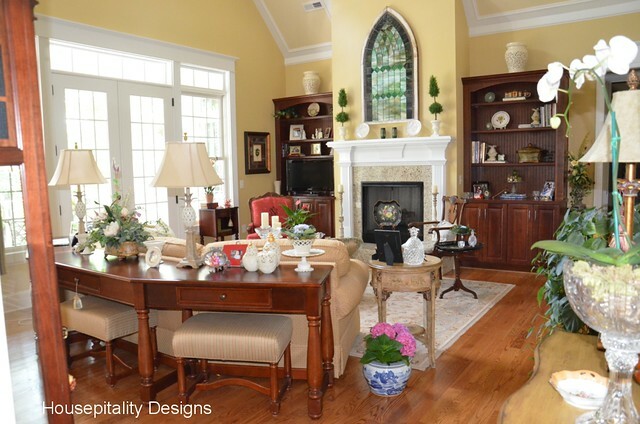 Shirley your home is one of the most beautiful I have ever seen. Every detail is addressed beautifully. I can’t decide which room I love the best cuz I love them all. You have done a masterful job decorating your lovely home. Have a wonderful weekend and thank you so much for the tour. What an amazing house!! Love all the detailed moldings and windows. just gorgeous!! What a lovely home! Thanks so much for the tour! Wow! 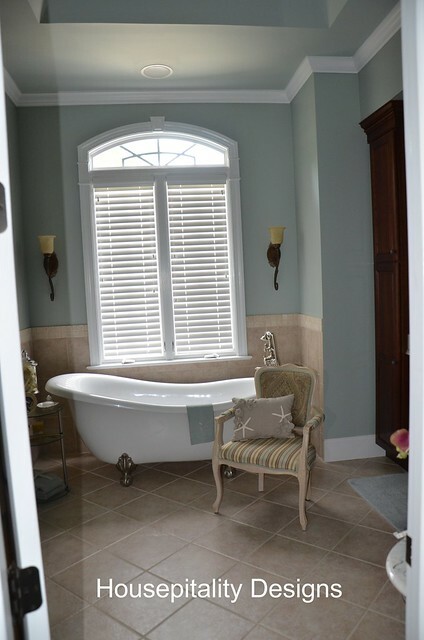 Such a beautiful home, loved every room and the bathtub is beyond gorgeous! Absolutely gorgeous! Shirleys home is so warm and inviting. It may be large, but gives a cozy feeling. I agree Jann, on that cozy feeling. She done great! I had my white gloves on, during the entire tour and did not find a speck of dust…anywhere! Beautiful home! Warm, fun, open and inviting! Well done! Thanks, Debbie and Shirley! She has such a beautiful home! Thanks for sharing! Besides the actual home itself, I love the color palette of the interior! Thanks for the tour, Shirley! 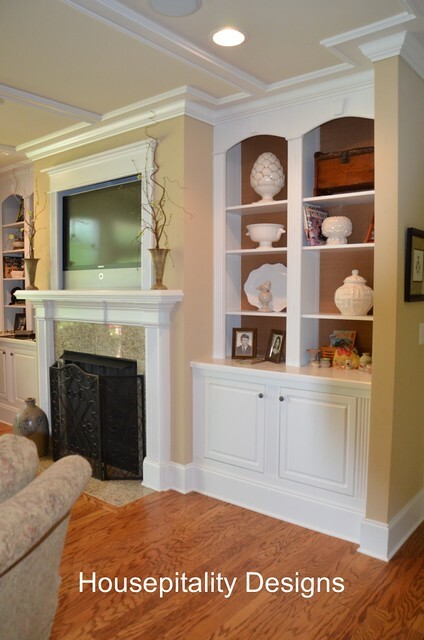 Your home is warm and inviting, with beautiful views inside and out! Love the colors and your attention to detail! Beautiful! Shirley! What a fabulous place – I love everything about it. You have a wonderful sense of style. Yes, Debbie..you are right! !….It is a tassel…Anne is hysterical…Super heroes can be very funny…as you know, she is “Aqua Woman”…. I love it! Beautiful home! Thanks for sharing! Super fantastic home tour. 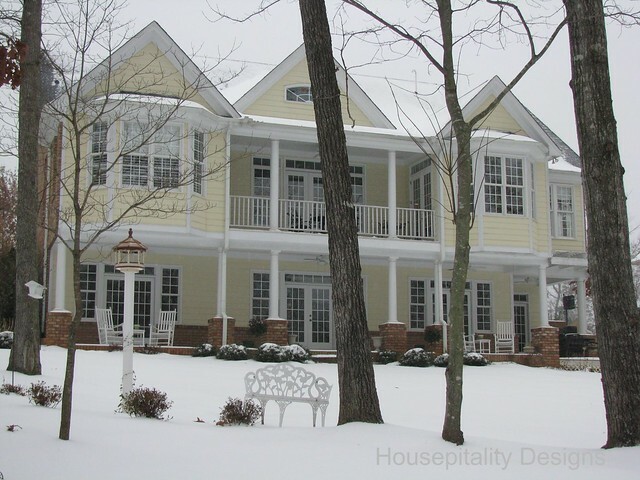 The back of the house in the snow looks amazing. Wow, Debbie, Shirley’s home is really something! It’s beautiful! I met Shirley during the Haven Conference and she is as sweet as her house is drop dead gorgeous!